Video: "Oohoo! Farangs show the Thais how to plow with a buffalo!" 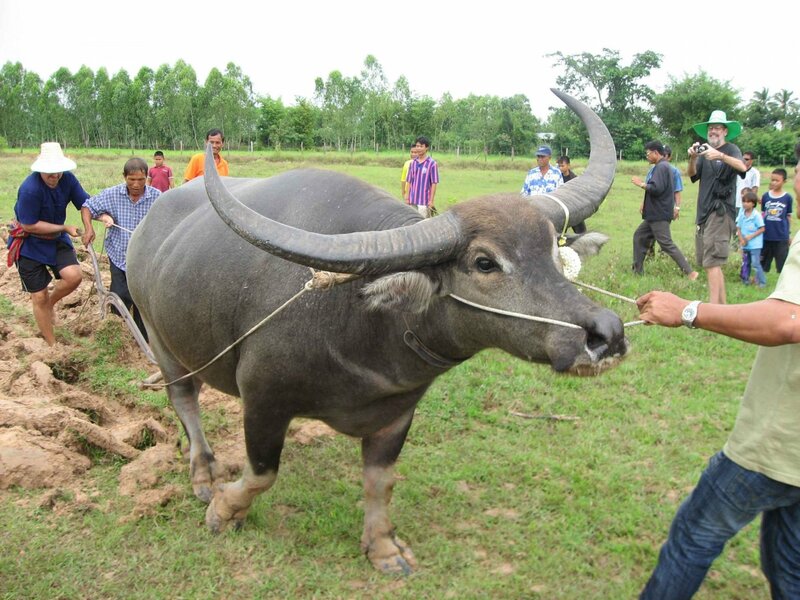 Thai TV featured a segment that showed seven westerners in a buffalo plowing contest. Up and down they went doing it in a traditional way - these guys needed no tractor! It was a competition in the village of Ban Pan Rua in Surin in Thailand's north east. Competitors came from Iceland, England, Scotland, Austria, Canada, Holland and Switzerland. Emerging victorious was Kerry from Iceland (the story in Thai said Iceland anyway, though we suspect he might have been Irish with a name like that...). Second was the guy from Switzerland. The presenters enjoyed themselves conjecturing that the village must have a lot of pretty women for so many farang son-in-laws to be present. Though later the male presenter suggested, hopefully tongue in cheek, that one of the buffaloes in a "Pretty Khwai" contest was one of their wives. TNA said that excitement was at fever pitch for the contest. Later on there was a competition for all-comers. Further reports can be found on the "LadBible". i wouldn't mind going along to watch this and fill in a couple of days in the countryside, bit different from the beer bar or the mall. tilling the soil for farming is actually the wrong way to do it according to science. Very interesting, buffaloes are doing good jobs with Farangs. 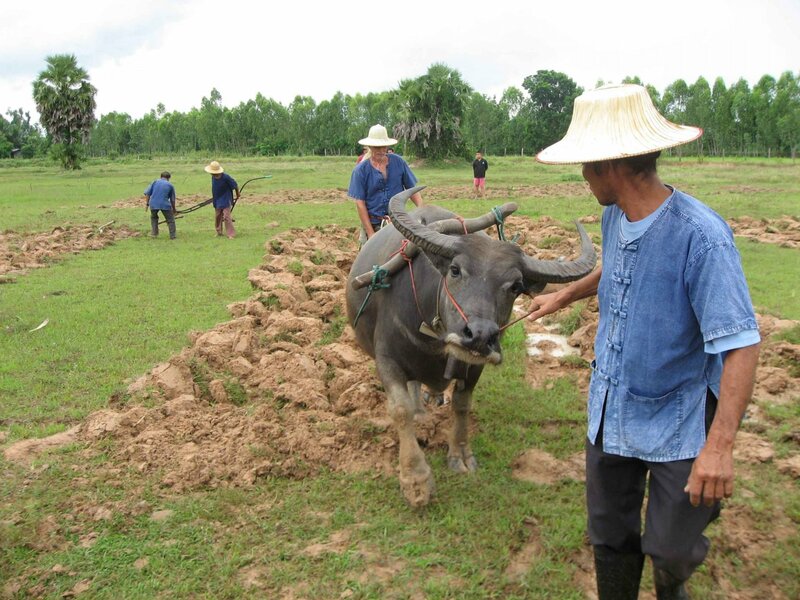 Looks like these dude are doing this everyday helping their Thai wives here, plowing often. most of the world still hasn't heard of aquaponics. Must be fake - buffaloes are sick all the time! That gets a big like from me but the smile motif is off line. A thought , I think this is a scam to show the locals that we are not all millionaires and plowing is what we did in the old country , we only came to LoS as the harsh winters in England kills off most heathens at 30 years of age. I hope you don't have any pre existing heart complaints ?? excitement was at fever pitch for the contest. A few years ago my wife and I went to visit Ban Chiang.. just by chance it happened to coincide with their World Heritage celebrations.. they had a buffalo plowing competition like this one.. very entertaining! Lots of live music, food stalls, a parade with local traditional costume.. plenty of beer and food.. nice town. We met some ferangs who live in the area. Altogether a great weekend.